Three US athletes with intellectual disability were selected to represent the US in the Global Games held in Liberec, Czech Republic July 5 – 14. Nearly 1,000 elite athletes from 40 countries competed for gold, silver and bronze in seven sports. This Wholesale Nike Washington Redskins Jerseys was the first time a team from the US participated in a world championship for athletes with intellectual disability. Cyclist Syd Lea of Taneytown, MD competed in a five-day stage race that included three time trials and two road races earning three silver and two bronze medals, as well as finishing second in the overall general classification to world champion Leandro Santos from Portugal. Syd Lea, pictured with the gold and bronze medalists, won 5 medals including the silver for his 2nd place overall standing in the 5-day cycling competition. Lea had especially impressive results in both road races. In the 30km race he stormed past a rival Czech cyclist, who finished third overall in the competition, in the last 300 meters before the finish line to claim the silver medal. In the 60km road race Lea road a tactically perfect race staying in small group until the final 5km when he made a wholesale mlb jerseys strong move to drop them and stay away through the finish to wrap up both silver on the day and second in the overall. “I raced really hard and for one time trial was really sick and tired from jet lag. I did what my coach told me on the short road race and rode it like a cyclocross race, as hard as I could go for the whole race. I Medal wanted to win Games medals and did. Next year I want to beat Leandro and be world champion,” said Lea. Swimmers Maria D’Andrea and Gail Morning get ready to represent the US at the Global Games. 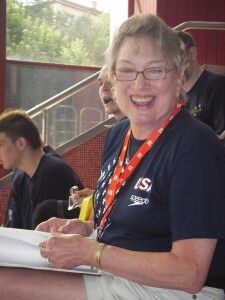 Karen Fisher, US Global Games Swim Coach, prepared the athletes for the challenging transition from competing in 25 yard pools to the 50-meter, Olympic-size pool in Liberec. Swimmers Maria D’Andrea and Gail Morning competed in the four-day world championship meet that was July dominated by the Australian, South Africans and British swim teams. D’Andrea scored impressive top ten finishes in the 800 Freestyle and 200 Freestyle and both swimmers had personal bests in the majority of the 10+events in which they competed over Song four days. To compete in the championships the cheap nfl jerseys US swimmers had to meet difficult qualification times as well as adjust their swimming from a 25-yard to a 50-meter pool. Richard Murby accompanied the team as both assistant cycling coach Gear and filmographer. The trip was organized by Athletes Without Limits, the USA Federation of Elite Athletes with Intellectual Disability. “We formed Athletes Without Limits to develop and support elite athletes with intellectual disability. Bringing a wholesale jerseys small team to the Global Games was a good first Titelverteidigung step and the athletes and coaches performed well despite a very short time frame for preparation and no national level support.” said founder Barry Holman. The results of all the competitions including video, photos have been posted at www.globalgames09.com while a list of news coverage is being posted on the Athletes Without Limits website.